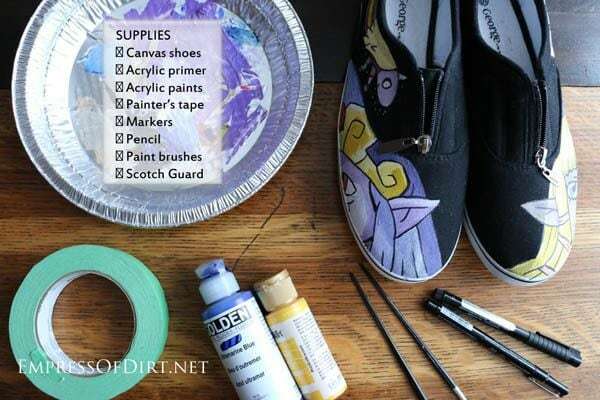 These tips show how to paint shoes and add unique hand-painted designs to your canvas shoes or sneakers with acrylic paint. We’ve tested a bunch of art supplies and recommend our top picks. 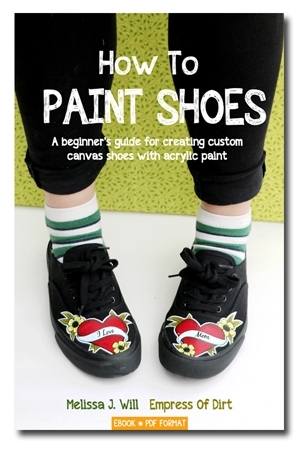 This is part of the complete ebook, How to Paint Shoes: Beginners Guide to Painting Canvas Shoes with Acrylic Paint, available for instant download. A few years ago my teenage daughter started customizing canvas shoes (which is now a business venture) and hasn’t turned back since. These are her tips and recommended supplies for best results. We also have this ebook which provides more information than we can fit in a blog post. It downloads instantly and is written for beginners. If you’re already experienced with acrylic paints on canvas, you probably just need a few ideas for specific materials to use (see below). I am linking to products with my Amazon affiliate account. These are products we like. Markers for outlining: Recommended brands include Faber-Castel Pitt artist pens, Prisma colour fine-tip markers, and Sharpies (make sure you get nice fine tips). Note: Metallic markers are not recommended because they run when Scotch Guard is applied. Paint tray, water cup for rinsing brushes, rag. Scotch Guard. [See Scotch Guard for outdoor fabrics] or polyurethane, Mod Podge Outdoor, and any other durable sealant. 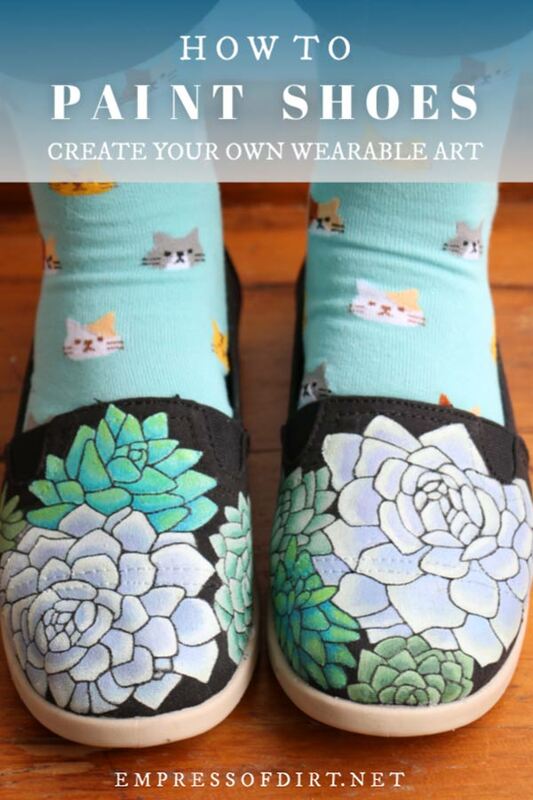 If you can paint it on a flat canvas, you can probably paint it on canvas shoes. Unless you’re an artistic daredevil, start simple. Pick basic designs you can fill with solid colours and outline with marking pen. From a distance, these simpler designs really look great. Go DaVinci on your second pair when you’ve had some practice. 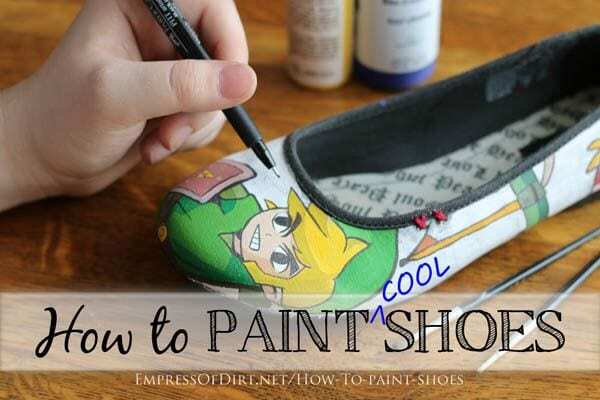 Try your design on paper first (to be sure you like it), then draw it on the shoes using an HB pencil. Heavy lines will show through the paint, so press lightly. Apply painter’s tape to any areas you do not want the paint to cover (such as the edge of the soles). Prime the canvas areas you will be painting. Allow to dry completely (usually takes an hour). You want the canvas covered in primer, but not so thickly that you loose the texture. The texture helps the acrylic paints “grab” the surface. Draw your design(s) on the shoes using an HB pencil. Go lightly or the pencil will show through the paint. 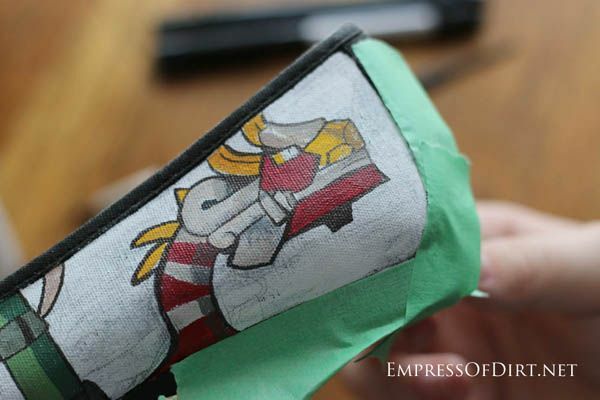 Fill in your designs with acrylic paint. Allow to dry completely. Use marking pens to outline your designs and add details. Allow to dry. Protect with Scotch Guard. There are several types: we use the one made for protecting outdoor patio fabric. Follow the product instructions. Alternately, you could use polyurethane, Mod Podge Outdoor, and some other durable outdoor sealant suitable for painted surfaces. You can simply paint over the area again, or reapply primer (allow it to dry), and then draw and paint your design again. If you get acrylic paint on the sole of the shoe, it may be removed with one of these. I tested all of them on different shoes and each one worked. Before trying it, tape over the good areas you want to protect. You want to be really careful when outlining the designs with marking pen. Find a comfortable position to support your hand and work slowly. You can also use the marking pens to add text on top of the paint. Pick quotes, poetry, or graffiti! Anything goes. It’s your art—do what you love. And remember to live long and prosper. Hi there! 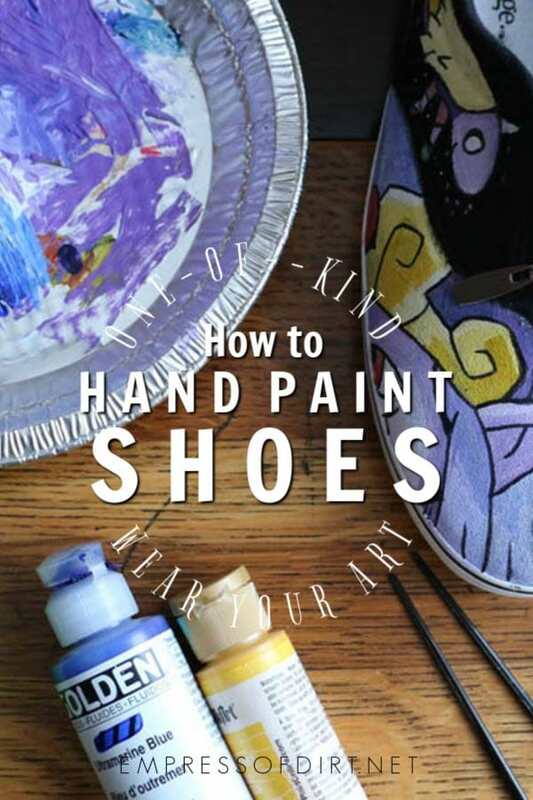 I’ve been looking for a tutorial on painting shoes, and found this! It was super informative. The only question I have is: I previously tie dyed my white Converse shoes pink, but now I want to paint on them using white. Will the pink affect the white paint on top or show through it? Hi, Depends entirely on whether the dye is set—I wouldn’t be able to tell from here but my guess is it should be fine. Even if the pink bleeds into the first coat, a second layer of white should cover it. If you can, do a spot test first. Good luck! 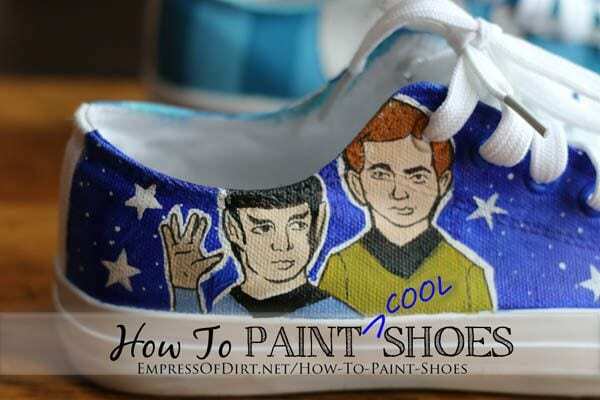 I am going to paint my own shoes soon, and this guide is perfect. You mention your daughter sells her custom shoes. Does she have a website as well? I would be interested in commissioning her to paint a pair of shoes. She’s all booked up with her art endeavors right now but thank you for asking. I hope you do try shoe painting! Hi im wondering about primers. All of them seem to be white. How do you get around this with black shoes. I have tried using bondcrete 1 part to 1 part water… this is clear. Any advise? Hi Carol, We’ve always used white primer and just painted the desired darker color over it. Another option we have not tested is a latex-based primer/paint all-in-one product. Let us know how it goes. Yes, better to do it at home so an entire can is not locked in to one colour! I was wondering if you could help me. I used apple barre paints. Sealed with an acrylic sealer meant for fabrics. And everything was fine with them, all colors have lasted, but the white. The white has cracked and ran. Not sure what happened and why only white. I have White canvas women’s Keds. I would like to paint them white to keep them looking good. Help Richard. Personally, I wouldn’t paint them. I would just apply Scotch Guard (made for outdoor canvas pillows) according to product instructions. I have read through the comments & also noticed in your notes that you use Scotchgard to protect the shoes after painting. Can you please tell me what type of Scotchgard you recommend? In looking I noticed there are several types for fabric use. Thank you! Hi Jan, This is the closest one I can find to what we used: https://amzn.to/2SzIZxg It’s Scotchguard for outdoor fabrics. I’m a black school librarian. My colleagues and I recently ordered custom canvas shoes from a custom shoes and accessories website. 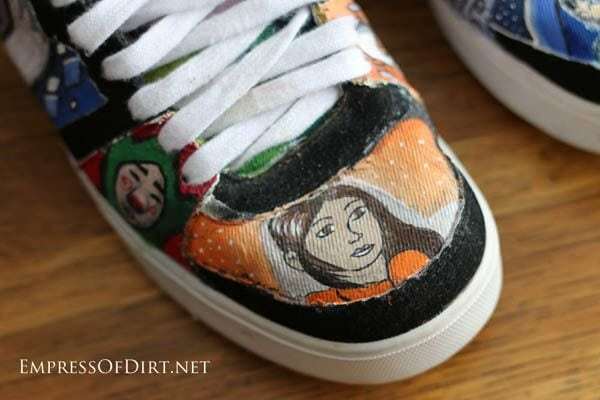 I would like to color in the librarian represented on the shoe to reflect what I look like. What would be the best method/materials to color in a cartoon character’s skin tone and hair? To get any skin tone, use a mixture of acrylic paints. If you’re new to this, definitely practice combining colours first until you get a good match. And remember what you did for the shoes! Thank you so much for your quick response and help! Hi Tiffy, No two pairs wear the same way. There are too many variables: the shoe itself, any finishes on the shoe, how the artist paints them, the exact paints used, how well the paints are allowed to cure, any finishes put on top, how the shoe bends when worn…. The best thing you can do is get a test pair to try everything out, wear them, and see. The test pair should be the same as the final pair, of course. I know it’s not an easy option, but, really, results do vary and there’s no way of predicting everything. Good luck! Hi, are there any alternatives to primer that work just as well? Not that I know of. There is primer for painting walls and primer for preparing canvas for art paintings and both are doing the same thing: you can find it in various size containers / prices if that is the concern. I WANT TO PAINT A PAIR OF SHOE (WEDGES) FROM MINT TO RED . THE SHOES IS MADE OF FRABIC WHAT PAINT AND MATERIAL IS THE BEST? Hi Esther, It depends on what specific type of fabric it is. Acrylic paint may work but can crack or peel too. You need to do a test on a different pair made of the same material. 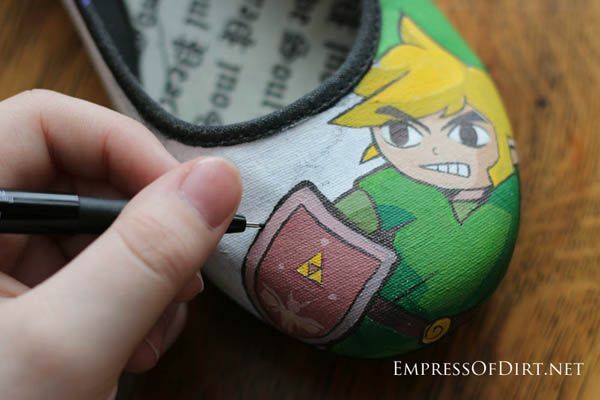 If you are only painting part of the shoe, do you still primer the entire shoe? Is the primer clear or white? Hi Laurie, We use plain wall primer which is solid white. You could just prime the section you want but it does take a steady hand to be precise with it. You can use painter’s tape to define the area and apply several thin layers of primer to get a nice clean edge. Hello. 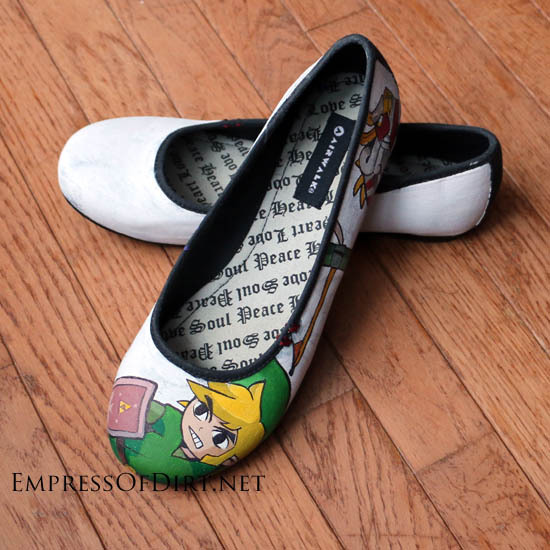 I want to paint a pair of shoes that I have, but they have a rubber toe cap. Can I still use the same paint even though it is a rubber surface? Hi Chelsea, We haven’t had good results painting rubber with these art supplies. You might want to buy some cheap shoes with the same type of rubber and do some tests first. The info here is just for canvas. I hope it works for you.